When you are thinking about an installer builder that can be configured by Scripting rather than GUI application so that you can save the script in your Source Control and maintain the script from Visual Studio, Inno Setup qualifies to be an excellent candidate to consider. You can configure the Installer by writing PASCAL scripts and store the Script in your source control same like you can store your C#/VB source code. This kind of installer builder is a critical requirement when you want to implement continuous integration for deploying your product. You must automate generating your installer as a part of your build process. So far so good. But what if you are passionate .NET Programmer who loves the environment of Visual Studio and you do not like to learn PASCAL language, or you do not have the time or motivation to learn and maintain a different scripting language! You want to reuse your .NET Skill which should be not only productive but also exciting for you. 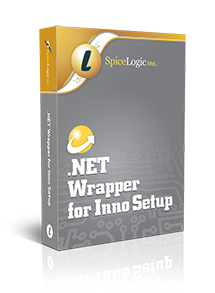 In that case, you would need a .NET Wrapper for Inno Setup so that, you can target a .NET Interface and the wrapper will generate the PASCAL script for you. Yes, exactly that's what 'Inno Setup .NET Wrapper' is. It is a FREE and open source .NET Class Library is written in C#. You can add the reference to that class library to your Project and configure your installer by setting various properties of a .NET Settings class. Ok, the wrapper class library has one public class named InnoSetupService. It will take various configuration info thru a .NET Class named SetupSettings in its constructor and based on setting, it will generate the necessary PASCAL script. If you just need the script what you would execute by yourself, then you can simply call a method named GenerateScripts(). That's all you need to generate scripts. Yes, you would need to specify the output folder path (in your Settings object) where you want your PASCAL script created. If you want the wrapper to execute the script and build the final installer (Setup.exe) file, you can call the other method named BuildSetupFile. This method takes the path of your Inno Setup Compiler as a parameter. Once you call this method, it will Generate the PASCAL script and then, execute the script using System.Diagnostics.Process class and capture the Console output for you. It is that simple. Open Source. The source code is open and easily customizable and extendable. Highly reliable. No dependency on MSI. Easy !! No steep learning curve like InstallShield. Supports Uninstaller Creation automatically. When you build your installer using this wrapper, your installer will create an uninstaller automatically and place the uninstaller in the Program Files / Start Menu folder. The uninstaller generated by this wrapper will be smart enough to delete the User's App Data Directory created by this application. Not only that, if no another application has been installed from the same company (your company), then the Company App Data folder will be deleted too upon uninstallation. Support Digital Signature. You can let this wrapper take care of signing all exe / dll (signable files) in your deployable folder. Not only that, it will sign your uninstaller too which is very rare to find in typical installer builders. If you have EV (Extended Validation) Code Sign Certificate that you want to use for signing your exe and dll files, you will find this solution extremely useful. Because most of the installer won't support EV Certificate to sign your files. Support Context Menu Shell Integration. An unlimited number of Prerequisite creation where each prerequisite download/install behavior can be programmed. Support 32bit/64bit installation. If the user's PC is a 32bit machine, then the installer will deploy the application in C:\Program Files(x86) folder. If the user's machine is 64bit then the application will be deployed in C:\Program Files folder. You can configure to use 'AnyCpu' too so that the installer will check the user's machine and deploy in the correct folder. You can add End User License Agreement file by setting a property easily which will be shown in the install time and ask the user if the user Agrees or Not. And lots more properties to fine tune the install behavior. Using this class library is very simple. First, you instantiate a Settings class (named SetupSettings) which contains lots of properties to configure your Installer. Then, instantiate a class named InnoSetupService which takes an instance of the SetupSettings class as a constructor argument. Now, if you want just to generate the PASCAL scripts, call the method: GenerateScripts(). If you want to Generate the scripts and build the Scripts automatically, call the method named BuildSetupFile(string innoSetupCompilerExePath). Yes, when you call the BuildSetupFile method, you would need to pass the Inno Setup Compiler path as a parameter. //and your Product short cut will be placed within this Company Name folder. // You should keep your product Guid Unique so that you can publish update easily with same Guid. // This folder contains all of the exe, dll etc whatever you want to publish to your user's computer. // published to your user's computer. // quickly and this property holds that short cut name. IconFilePath = "C:\\My Project\\Resources\\my-icon.ico", // This icon will be shown in Desktop and Start Menu. // If you set this property, only then a End User License Agreement Screen will be shown, otherwise no EULA screen will be shown. // This property is self explanatory, you can set PlatformNames.AnyCPU, PlatformNames.x64, PlatformNames.x32 etc. // If you set value PlatformNames.x64 then your application will be installed in "C:\Program Files" folder. // If you set value PlatformNames.x32, then your application will be installed in "C:\Program Files (x86)" folder. // installed in "C:\Program Files" folder otherwise it will be installed in "C:\Program Files (x86)" folder. // This folder is the place where InnoSetup Intermediate scripts will be generated. // deleted and new scripts will be written. // This is the path where your final Installer file will be created. // If a file already exists in this path then the existing file will be replaced. Prerequisites = new List<Prerequisite> // This is a collection of prerequisites. // Prerequisites can be .NET Framework, SQL Express Local Db etc. // microsoft .net framework 4.5. // This example is a very basic common usage. Here we did not set any extra property of the DotNetFrameworkPrerequisite. // Therefore, by default, the installer will check if the .NET framework version 4.5 is installed in user machine or not. // If not, then, the installer will take the user to the official Microsoft .NET framework 4.5 download page. // you wont risk missing the user's installation. Please check the documentation for details. // invoked and the full file path of the double clicked file will be passed to this exe file as command argument. // So, you can program your application to receive this file path as command Argument. // The constructor takes the path to your SignTool.exe file. // Yes, you can program to Sign All Signable files (like exe and dll files) including the Uninstaller. // in a installer software. If you do not want to digitally sign your files, then, do not set this SignToolInfo property. // Another exciting feature is Windows Context Menu Shell Integration. // That means, you can right click on a file or folder and invoke your application. // If you do not want the Shell Integration, then do not set this property. // allow the user to right click on an image type file to invoke the application. // = WindowsShellContextMenuItem.TargetTypes.File then the Context Menu will be shown on Any File type. // we can instantiate the  InnoSetupService and pass this Settings object to the constructor. // hopefully someone will come up with an upgrade which will work on the future version. // is captured from the Console output of InnoSetup. // Yes, you need to pass your InnoSetup Compiler File Path. At the time of this writing, This wrapper library is working fine on Inno Setup 5. // If all goes good, then, your Setup.exe file is built by this time and stored in the path you defined in the property named OutPutSetupFilePath. // If you just need to generate the PASCAL Scripts without building the installer automatically, you can call the method : GenerateScripts(). You may need to know little more about the Prerequisite feature. Prerequisites can be .NET Framework, SQL Express Local Db etc. This library will allow you to add as many prerequisites as you want using a List<Prerequisite> type property in the Settings. The installer will check for all prerequisites before installing the application to your user's machine. This Prerequisite class is an abstract class so that you can implement various Specific Prerequisite like DotNetFrameworkPrerequisite, SQLExpressPrerequisite etc. Every prerequisite can be configured to either install directly from Installer or Download from the Web. IF you prefer to download from the Web, then you can super configure to define if the required prerequisite file should be downloaded automatically from a remote URL or it will simply navigate to a Download page and user can download the necessary prerequisite from that page. For example, if you want to define .NET Framework 4.5 is a prerequisite for your application, then, you can let your user navigate to the download page of Microsoft .net framework 4.5. You can see the source code of these prerequisite classes and create your prerequisite subclass very easily. This prerequisite will check for a required .NET Framework version in your user's computer. If the correct .NET Framework version is not found in your user's computer, then, some actions will be executed. If you want to navigate your user to the Microsoft's official download page for that specific .NET Framework, then, you may not need to configure the DotNetFrameworkPrerequisite much. A code snippet like this will be enough. If you want to host the .NET Framework installer file in your server and download and installed automatically to your user's machine if the framework is not present in your user's machine, you can use the code snippet like this: (All sub-properties are explained in the comments). // for 64 bit, so that if the user's machine is 64 bit then the url from other entry will be used. // as prerequisite no matter 32 or 64 bit version of windows the user is using. // this is the url from where the .NET Framework will be downloaded. AlertPrerequisiteInstallation = false, // Silently download and install. MessageWhileInstallationInProgress = "Please wait while setup install prerequisite: .net framework..."
// asking the user. But yes, a message will be shown from the property value MessageWhileInstallationInProgress. SQL Server 2012 Express Localdb has been an outstanding choice for developers when a lightweight embedded sql server is required for a desktop application. Therefore, I have implemented another Prerequisite for that too. Same like DotNetFrameworkPrerequisite you can configure this prerequisite to navigate to Microsoft Website for downloading (if the localdb is not present in user's machine), or you can configure to silently download and install from your hosted repository to your user's machine. I am providing some sample snippets where the comments are explaining the properties in details. This snippet shows how to download and install the correct version of SQL Server LocalDb to users machine based on user's machine's 32bit/64bit architecture. MessageWhileInstallationInProgress = "Please wait while setup install prerequisite: SqlLocalDB..."
If you want to embed the SQL Server LocalDb in your Installer (Setup.exe) file so that if the correct SQLServerExpress LocalDb is missing on your user's computer, the LocalDb Installer will be extracted from your installer and being installed on your user's machine, then you can use similar to the following snippet. So, that's pretty much everything about this Wrapper class library.